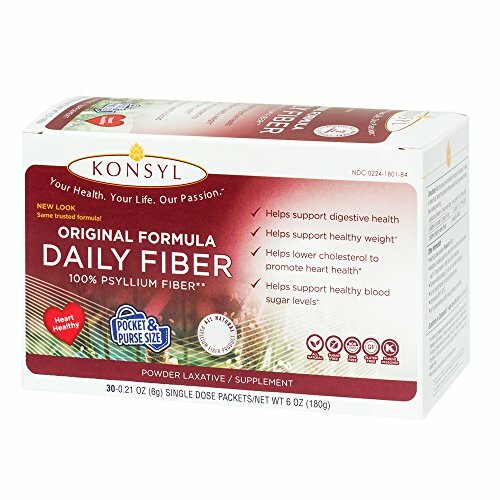 Konsyl Original Formula is a 100% all-natural psyllium fiber. Helps to lower cholesterol to promote Heart Health. * Also helps support: Diabetes Management+ , Digestive Health, and Healthy Weight+ Use as a Fiber Supplement: An easy way to increase your daily fiber intake. Only certain soluble fibers, such as the psyllium fiber in Konsyl, have multiple health benefits, because of its' gelling action. As psyllium forms a gel, it acts like a sponge and absorbs toxins in the digestive tract. Use as a Laxative: A bulk forming laxative, psyllium fiber is frequently used to treat constipation. It absorbs liquid in the intestines, swells and forms a bulky stool, which is easy to pass. Generally produces bowel movement in 12 to 72 hours. *Diets low in saturated fat and cholesterol that include 7 grams of soluble fiber per day from psyllium husk as in Konsyl Original Formula may reduce the risk of heart disease by lowering cholesterol. One adult dose of Konsyl Original Formula has 3 grams of this soluble fiber. + These statements have not been evaluated by the FDA. This product is not intended to diagnose, treat, cure, or prevent any disease. If you have any questions about this product by Konsyl, contact us by completing and submitting the form below. If you are looking for a specif part number, please include it with your message.